Hand Chemistry Glow Oil, this is DHA free, you may know that DHA is a sunless tanning agent that is safer for the skin but this Glow Oil is different and contains none of that instead it's developed it's own a raspberry-based keto-sugar, it develops a gradual golden glow to the skin that's meant to be more healthy looking than a deep bronzed tan from Hawaii. This is a dry oil, with invisible golden prisms within the formula that needs shaking up. This is to be used up to twice daily and then cut back to once daily to maintain the look or desire appearance. It can be mixed with moisturiser if you don't like the feel of a dry oil but I found that give it at least 5 minutes and it starts to absorb well into the skin. I find it smells similar to it's Retin-Oil, a nice watermelon smell which makes it better although the next day I started to smell that faint biscuit smell, which I was disappointed with, I don't know if I applied too much of the oil or this is what happens. On day 2 the smell had disappeared as I didn't top it up the night before. I notice very subtle change to my skin, I apply this to my arms, legs and chest. I don't see any shimmer after application or in the sun but I used it on my nan who's about 3-4 shades darker than me and she was left with a golden glow to her arms that gradually faded. As the days go by, there's a nice colour appearing and it's fuss free, non-drying and no mess! On the 2nd day maybe it was the combination of the sun and the product but people were giving me compliments on how good my skin was glowing. Image below was on the first day applying the dry oil on my inner arm. If you prefer DHA products Sukin Sunless Bronzing Gel is a vegan product, this can be applied daily to clean skin for a gradual glow. I like that this product hasn't got a bad smell which is what puts me off with products included within the ingredients are Australian lemon myrtle and lime oils which helps the scent within this bronzing gel. The active bronzing ingredient is dihydroxyacetone (Stainers) more commonly know as DHA, this is the most commonly used ingredient because you don't need the sun to activate it. DHA, is a colourless 3-carbon sugar, when applied to the skin it causes a chemical reaction with the amino acids in the surface cells of the skin, thus producing a darkening effect. Within this product you'll find NO parabens, sulphates, synthetic fragrances, animal derivatives, harsh detergents, propylene glycol, artificial colours, triethanolamine, mineral oils & EDTA. Making it a brilliant choice for people to get the benefit without harming the body inside and out, it's good for all skin types and for face and body. Sukin Hydrating Mist Toner, is another Sulphate and Paraben Free product and also alcohol free. Alcohol free toners are what we all should use, takes me back to American Psycho when Patrick Bateman says to never use one with alcohol because it dries out and ages the skin or to quote "with little or no alcohol, because alcohol dries your face out and makes you look older." I like to use this to spray throughout the day also because it's very light mist, smells fresh and uplifting and I put that down to the Rosewater & German Chamomile. Chamomile is antibacterial, anti-inflammatory and anti-irritant, making it good for those who suffering from redness or irritated skin. Chamomile does a good job of keeping our natural oils from over or under producing making the skin balanced. Because it has emollient properties it helps the skin to maintain moisture while working perfectly with natural oil production of the skin to perform at high levels. What would you pick? Are you fussed about DHA in your sunless tanning products? What a great range - love products that make it easy to avoid parabens, a big no-no on my skin. Just curious to know if any of this can be used by guys? I am, for a guy, well into skincare. I've been using Jojoba oil in this heatwave and it's been marvellous but this range looks great. Oh I'd definitely say unisex John, why not as it's only to give the skin a healthy natural glow rather than a bronzed look. Jojoba oil is amazing, I'm crazy for oils lol. 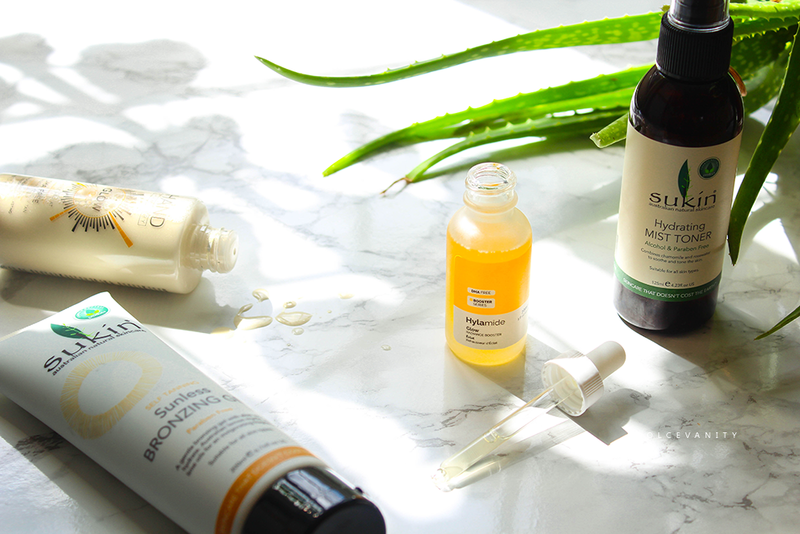 Your skin looks gorgeous and very moisturised with the oil - even from day one! Thank you Samantha, it does give it a nice healthy sheen thanks to the oil and develops nicely as a glow. Yes the glow oil is amazing. I'm loving the natural glow it's given me. 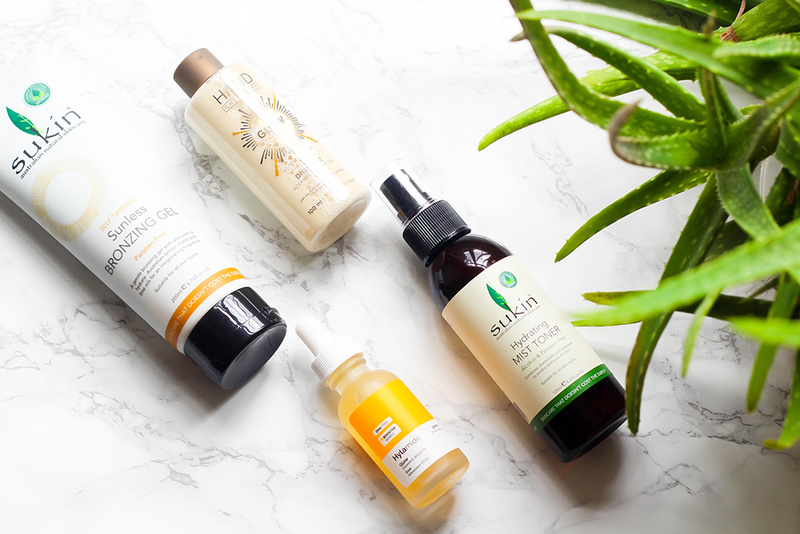 Those products look fantastic, especially the glow oil. Your skin looks so healthy. Hmm, I don't know a lot about DHA but it would be interesting to try all of these. I'm new to tanning products. I occasionally use them when I want to have more of a glow to my skin especially in winter. I don't take to much notice of the ingredients of the suntan creams, but this post makes me feel like I should. Yes I never did much but I do like the more natural factor to these. I love the sound and ease of the facial dry oil! Yes the facial dry oil is amazing - think I'm addicted. I don't like sitting out in the sun, so I need a good fake tan option. Yeah it's never a good thing to do that, I'm out there if I need to be. lmao ghostly glow. Yeah I'm finding there's controversy with nearly everything these days. That's good at least you're protecting yourself, important. I never mind using a high spf myself. I recommend them, they are very easy and I like how I've gotten a natural glow - really pleased. Love your tip about going all the way down to the jawline - Every teenage girl should take note! Your skin looks so shiny but not greasy. These sound lovely - I love the idea of a sun free glow! This looks like a great product! I love the tip about the jawline. I must try these! I'm extremely pale and always looking for something to help me feel a bit more confident out in the sun! I am not keen on going out in the sun, if I do I am mostly covered apart from my arms. Arms are nicely tanned and rest is see through. Ooh, I'm very tempted by that Hand Chemistry product - I'm very pale and I could do with a little help before I go on holiday! I love the idea of building up a gradual glow rather than doing an intense fake tan. I need to use these on my legs!